This week's update on Sprout's emerging language skills, favourite toys & food plus the latest photo. Another thing I find funny is how his pronunciation of words changes. A good example is his word for bunny: it's changed from benny to bendy to bundy to bundin. It seems odd that his phonetic realization would actually get further from the usual adult pronunciation, but this is a totally normal process. Sprout continues to be fascinated with small things, from fist-sized to miniscule. His favourite toys are often ordinary household objects, like grocery bags. We have a few that fold or bunch up into little pouches, one of which is painted to look like a bee. He's actually cried when I put it away in my purse because he thinks it's his. I've also noticed him picking up tiny bits of fluff, & trying to pick up a tiny spider he found outside. I'm excited that he's also started to get more interested in drawing. He will actually make scribbles on his magna doodle & when given crayons, he now spends more time making marks than nibbling them. As soon as I'm finished school, I have plans to make him some creative toys: finger paint & playdough, maybe a felt board. I'd also like to get him an easel soon, possibly this one. Another new development is Sprout's constant movement. He does stay put & 'read' books for a few minutes a day on his own, but he moves around a lot more these days. When we're in the kitchen at the table & he's finished eating, he tends to orbit the table, walking around & around us. He's been getting a bit more adventurous on the playgrounds lately too, but still cautious when walking on bark mulch, gravel or sand. Sprout's favourite food this week was definitely kamut puffs. They are full of air, but he made a serious attempt to eat his weight in them. He's also become a bit of a chocoholic (not unlike his mama, ahem) & started asking for dok-ate a few times a day. I'll usually let him have a little piece of brownie or chocolate one of the times that he asks. Napping continues to go well, with some really good three-hour stretches a few days this week. Oli or I will read him a story then pop him in his crib & he goes to sleep without a fuss in a half hour or less. I've noticed that he likes to have a book with him in bed, so I've started giving him one or two. Yesterday he fell asleep in the middle of 'reading' his favourite Boynton book: Opposites. Adorable!!!!!! 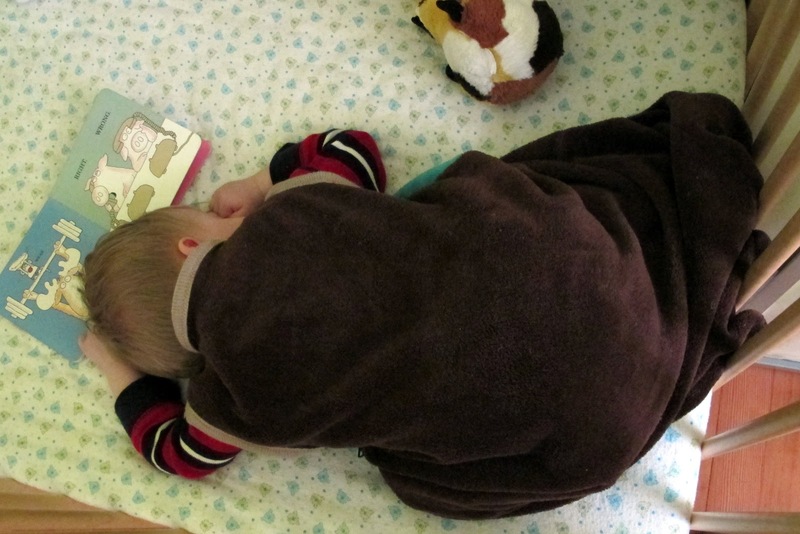 NOTHING cuter than a konked out little person = especially with a book. With Theo, it's cars, trucks and cars and trucks... and did I mention cars and trucks?